Police Chief IGP Pujith Jayasundera is under fire from the Opposition and corruption watchdogs after he was caught on camera attempting to interfere in an investigation by the Financial Crimes Investigation Division (FCID) earlier this week. As calls mount for action against the IGP and the release of information about the caller on the other end of the telephone in the controversial video, President Maithripala Sirisena told Parliament in response to questions raised by the opposition on Thursday (1) that he was calling for explanation from the Police Chief over the revealing video. The Constitutional Council which nominates the IGP for appointment by the President, is looking very seriously into the matter, a senior member of the Council told Daily FT. The Constitutional Council member who requested confidentiality to speak openly said the IGP’s behaviour was “not acceptable” and added that some action would be necessary. Daily FT learns that the Constitutional Council and President Sirisena have already warned IGP Jayasundera several times over the general conduct of his department. The National Police Commission of Sri Lanka, an independent body set up to supervise the Police Department, will not be launching an investigation into Jayasundera’s conduct since the IGP did not fall within its jurisdiction, a Spokesman for the Commission told Daily FT.
Media Officer for the Police Commission Priyanci Liyanarachchi said that under the provisions of the constitution, the NPC only had jurisdiction with police officers below the rank of the IGP. “It would be up to the Constitutional Council and the President to act on this issue,” Liyanarachchi said, acknowledging that the Commission had knowledge of the controversy. Executive Director of corruption watchdog Transparency International Sri Lanka (TISL), Asoka Obeysekere said that while the incident was not surprising, the deferential tone in which the IGP spoke reemphasised the power imbalance between those wielding political power and those entrusted with safeguarding law and order. Obeysekere noted that under Section 56(d) of the Police Ordinance a police officer's duty is "to detect and bring offenders to justice." "However, when the IGP verbally guarantees that no arrest will be made, as he has instructed the FCID director to get his permission first, it alludes to a potential misuse of his authority over the FCID which needs to be urgently clarified," the TISL Executive Director told Daily FT.
Advisor to the Anti Corruption Front Rajith Keerthi Tennakoon also criticised the incident, saying it indicated that there was still political pressure on the police and that the police were "willingly cooperating." The scandal, being referred to as “phonegate” on social media, was raised in Parliament with Chief Opposition Whip and JVP Leader Anura Kumara Dissanayake telling the House on Thursday that the caller had been Law and Order Minister Sagala Ratnayake, and challenged the Minister to deny the charge. The ‘Nilame’ in question, Dissanayake further revealed, was Dishan Wickremaratne Gunasekera, the current lay incumbent of the Devundara Vishnu Dewale in Matara who was under investigation by the FCID for allegedly misusing Government vehicles and financial irregularities at the temple. “He is a very close associate of the former rulers. He was protected by the leaders of the former regime,” Dissanayake revealed. During his speech in Parliament, Anura Kumara Dissanayake charged that the incident made it clear that Government members were actively working to undermine the rule of law. Repeated attempts yesterday to reach the IGP and the Law and Order Minister for comment proved unsuccessful. The entire conversation was recorded during an event attended by the IGP at which media was present and cameras and microphones were already set up for filming. The video first aired on a private news channel, showed the IGP assuring his caller that he had provided clear instructions to the FCID to refrain from arresting the ‘Nilame’. 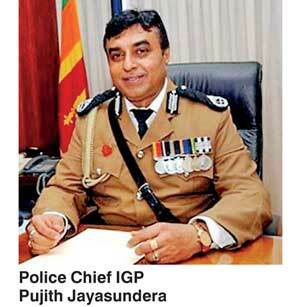 “Arrest wenne na sir (He will not be arrested, sir),” IGP Jayasundera was filmed saying to the caller.